5/3/2016: Levi has made a lot of progress! 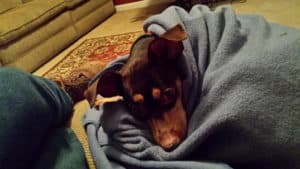 As a typical min pin, he just wants to be with family and he loves with all of his heart, but is sensitive to strangers. Are you looking for a reading or cuddle partner? He will sit and read with his foster mom for hours, and he loves to cuddle to watch TV. He will bark if she is home and not in sight. How about a Youtube partner? His favorite thing seems to be watching Youtube. It’s a riot. He gets his nose all the way to the laptop or phone and will watch as long as you hold the computer for him. Levi still loves to ride, and he also enjoys walks. He will walk for miles if it means his family is with him. He prefers to sleep in bed with his foster mom and dad, but they have finally gotten him to sleep on the floor in their room. Somehow they figured out Levi likes the laundry basket! 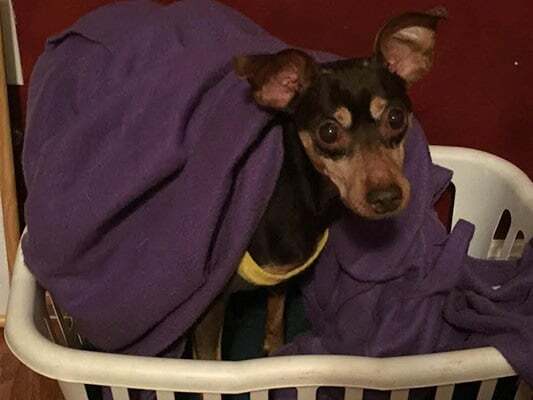 He will sleep there under blankets and most nights he will sleep through on his own. Levi does well with other dogs, and he adores our female bulldog. The dog door has also been a real help with him. Although he is not 100% housebroken, the number of accidents he has has decreased tremendously, and usually only when he is unattended. He is crated when no one is home, and being crated is not his favorite thing! Going to the vet and trimming his nails are other things that are not on his favorite list! Like most of us, Levi has his quirks, but they make him the very special little boy he is. If you would like to make Levi a part of your family, please fill out an adoption application today! 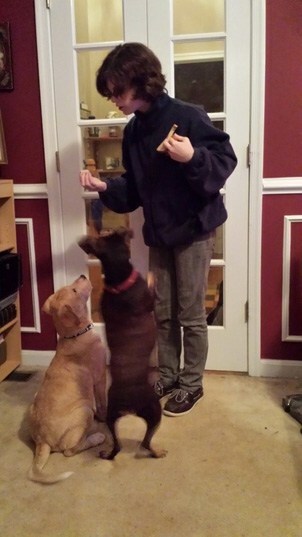 Levi would do best in a home without small children. 12/22/13: Levi came to us from the shelter a very scared, timid little man. Over the past 10 days we have taken everything incredibly slowly to give him the best possible chance for success. Levi continues to amaze us every day with his progress. Although he doesn’t know any commands (we are trying to teach this old dog some new tricks) he is a rock star on a leash. Levi LOVES to ride in the car and go anywhere his humans go. Levi is a complete cuddlebug in the house and will lay with you all the time. He is doing well crated during the day but would probably prefer a home with more people during the day. He is currently living with 5 other dogs and 3 cats. He doesn’t pay much attention to the cats and is not a play machine with the dogs either. He is more concerned about the humans. Levi, per owner surrender form, was never housebroken. We are doing our best to address it. Levi is forever in our hearts. Levi is looking for his forever home. If you think it could be yours, read more about Adopting from BDRA before submitting your application below. BDRA relies on your donations to rescue blind dogs around the United States. Please consider giving in support of Levi.